Back home there was a guy Art who lived across the street from us who had a supervising role managing the custodians at my high school. My friend Liam also worked at Logan for a couple summers doing janitorial work. Between Art’s stories about pulling all-nighters on the eve of the first day of school, and Liam’s stories about all the things he and the other janitors would do while school was out, I understand that for most schools, summer is a good time to air out the place and some good housekeeping is in order. 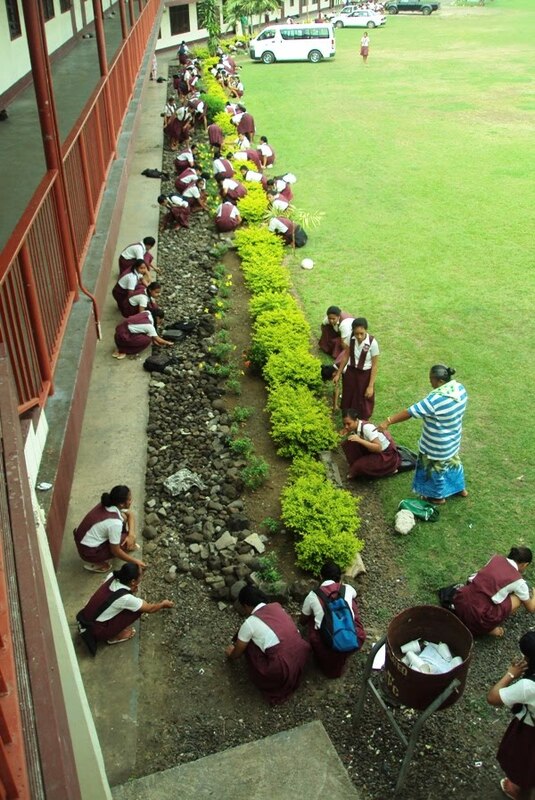 At my school here in Samoa, the academic year is bookended with a week of cleaning at the beginning and end of the year. The big difference, of course, that instead of professional cleaning crews, students do all the work. I remember thinking this was a little absurd the first time I saw it in action back in January. It was as foreign as foreign gets to see droves of students weeding and clearing brush outside, and sweeping and mopping classrooms. 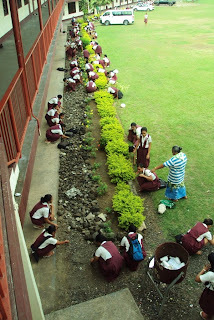 Maybe I’ve just had time to get used to the idea or maybe I’ve just been in Samoa long enough to accept some of the customs I’m not used to, but the idea of students cleaning is beginning to make sense. In fact, I think it’s a good thing on a couple of different levels. In the abstract, it works as a method for making the students take ownership of the school, and in a more concrete way, it works on a very basic how-to level. I did my fair share of vacuuming growing up, but I feel like if I had been obligated to do manual cleaning at Logan, I’d be so much more practiced today, such a better sweeper. It’s sounds goofy, but I’m somewhat serious. And fellow Logan alumni can attest the school had very little school spirit. But I think cleaning, landscaping, power-washing gives a person a sense of pride. It seems like the kids here have it. Working at the pool back in the day, I remember Robert the pool attendant who used to wash the pool deck every Friday and how it kinda made them feel like it was his pool. At the same time, I think the kinda hate it. My principal called me aside this morning and told me I needed to have some students clean the computer lab today, so I walked around to see who was doing what so I could, perhaps, rescue some students from some nasty job. But there were so many toiling in the sun. So I guess the system has its ups and downs. And I guess the biggest down would be that all this cleaning time would be better spent in the classroom, you know, learning. There are probably better things in life than being a sweeper. Girls sweeping the computer lab. Boys standing on tables sweeping the walls of the Great Hall. Boys (the same ones as above the fold) standing on the roof washing the windows. I found this strange because all of the windows are openable, and therefore could have been washed from inside the classroom. But I think they were washing other stuff up on the roof as well, so I guess it made sense. Samoa is on Google Maps! You heard it here first! See the larger map here. Wow Apia on Google Maps you should contribute street level pictures for Google Matt. Lol @ the memories. 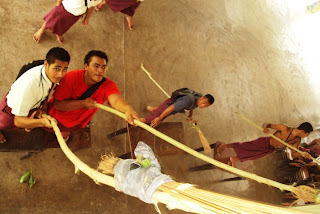 I spent a year at school in Samoa. I remember picking up rubbish around our own home before going to school. Then when all the kids had to clean the school grounds I went home complaining that I did more cleaning than school work that day!